It seems Orkut is working really hard to get new features on board. So, after complete design makeover, here comes another feature. On your Orkut profile page, you will get list of all the updates from all your Orkut friends. What kind of updates? Well, this should include everything like: adding new photos, adding new videos, profile updation, new testimonial and much more. Besides the functional importance of this feature, it also profile profile page a complete look. Remember that empty space at the bottom part of middle column! Login into your Orkut profile. Click on settings option at bottom left part of the page. Then click on privacy tab. Click on ‘hide updates’ option. Personally I would like to keep this feature ON, because there will be some thing more NEW information to discover about my Orkut friends. 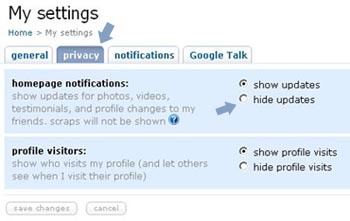 However, as the Orkut BlogÃ‚Â reports… there are some things on your profile we know you want to keep private (e.g., not letting your boyfriend know about that new guy you just friend-ed).Ã‚Â In such cases turning OFF updates feature will come handy. Tip: How to Search PDF Files using Google Search?